Mortgage backed securities allow investors to gain exposure to the housing market by taking on credit risk linked to a pool of mortgages. Although the underlying mortgages are originated by banks, the existence of investor demand for MBSs allows the originators to effectively pass the mortgages off to the investors and pocket a fee. Thus, the greater the demand for MBSs, the greater the total value of mortgages that originators will issue and ultimately pass off to investors. So, the originators might front the money for the mortgages in many cases, but the effective path of funds is from the investors, to the originators, and onto the borrower. As a result, investors in MBSs are the effective lenders in this arrangement, since they bear the credit risk of the mortgages. This market structure also has an effect on the interest rates charged on the underlying mortgages. As investor demand for MBSs increases, the amount of cash available for mortgages will increase, pushing the interest rates charged on the underlying mortgages down as originators compete for borrowers. This is not the case with a mortgage. The lender gives money to the borrower, who then spends this money on a home. Say a lender and borrower entered into a mortgage and that before it's paid off, the value of the home falls, prompting the borrower to default on their mortgage. Generally at this point the lender forecloses on the property, selling it at a loss. Since the buyer receives none of the foreclosure proceeds, the buyer can be viewed as either neutral or incurring a loss, since at least some of the borrower's mortgage payments went towards equity ownership and not just occupancy. It follows that there is a loss to the lender and either no change in or a loss to the borrower and therefore a net loss. (If the mortgage encouraged builders to spend too much building houses no one wants, there's a net loss to the economy as a whole.) This demonstrates what we have all recently learned: poorly underwritten mortgages can create net losses. You can argue that even in the case that both parties to an agreement incur losses, the net loss to the economy is zero, since the cash transferred under the agreement was not destroyed but merely moved through the economy to market participants that are not a party to the agreement. That is, if you expand the number of parties to a sufficient degree, all transactions will net to zero. While this must be the case, it misses an essential point: I am using net losses to bilateral agreements as a proxy for inefficient allocation of capital. Both parties to the mortgage expected to benefit from the agreement, yet both lost money, which implies that neither benefited from the agreement. For example, in the case of a mortgage, the borrower expects to pay off the mortgage but benefit from the use and eventual ownership or sale of the home. The lender expects to profit from the interest paid on the mortgage. When both of these expectations fail, I take this as implying that the initial agreement was an inefficient allocation of capital. This might not always be the case, and of course it depends on how you define efficiency. But as a general rule, it is my opinion that net losses to a bilateral agreement are a reasonable proxy for inefficient allocation of capital. As mentioned above, under a mortgage, the lender expects to benefit from the interest paid on the mortgage, while the borrower expects to benefit from the use and eventual ownership or sale of the home. Both parties assume that the mortgage will be repaid. An economist would say that the lender is long on the mortgage, which is to say, the lender gains if the mortgage is fully repaid. Although application of the concepts of long and short to the borrower's position is awkward at best, the borrower is certainly not short on the mortgage--they do not gain if they fail to repay the mortgage. They might mitigate their losses by defaulting and declaring bankruptcy, but that's not really an improvement on their position before they bought the house. Both only really benefit if, as they both expect, the mortgage is fully repaid. If we consider only lenders and borrowers, then, there are no participants with a true short position in the market. Thus, price, which in this case is an interest rate, will be determined by participants with similar positive expectations and incentives. Anyone with a negative view of the market has no role to play and therefore no effect on price. This is not the case with credit default swaps (CDSs) referencing MBSs. In such a CDS, the protection seller is long on the MBS and therefore long on the underlying mortgages, and the protection buyer is short. That is, if the MBS pays out, the protection seller gains on the swap; and if the MBS defaults, the protection buyer gains on the swap. The two parties are expressing, through the CDS, their opposing expectations of the performance of the underlying security. Thus, the CDS market provides an opportunity to express a negative view of mortgage default risk. As mentioned above, the CDS market provides a method of shorting MBSs. But how does that effect the price of MBSs and ultimately interest rates? As I've previously described, the cash flows of any bond, including MBSs, can be synthesized using Treasuries and CDSs. Using this technique, a fully funded synthetic bond consists of the long end of a CDS, and a Treasury. The spread that the synthetic instrument pays over the risk free rate is determined by the price of protection that the CDS pays the investor (who in this case is the protection seller). One consequence of this is that there are opportunities for arbitrage between the market for real bonds and CDSs if the two markets don't reach an equilibrium. Because this opportunity for arbitrage is rather obvious, we assume that it will be quickly traded away. As the price of protection on MBSs increases, the spread over the risk free rate paid by MBSs should widen, and visa versa. Thus, as the demand for protection on MBSs increases, we would expect the interest rates paid by MBSs to increase, thereby increasing the interest rates on mortgages. So those with a negative view of MBS default risk raise the cost of mortgage funds by buying protection through CDSs on MBSs, thereby inadvertently "correcting" what they view as underpriced default risk. In addition to the no-obvious-arbitrage argument outlined above, we can consider how the existence of synthetic MBSs affects the supply of comparable investments, and thereby interest rates. As mentioned above, any MBS can be synthesized using CDSs and Treasuries (when the synthetic MBS is unfunded or partially funded, it consists of CDSs and other investments, not just Treasuries). Thus, investors will have a choice between investing in real MBSs or synthetic MBSs. And as explained above, the price of each should come to an equilibrium that excludes any opportunity for obvious arbitrage between the two investments. We'd expect at least some investors to be indifferent between the two. Depending on whether the synthetics are fully funded or not, the principal investment will go to the Treasuries market or back into the capital markets respectively. 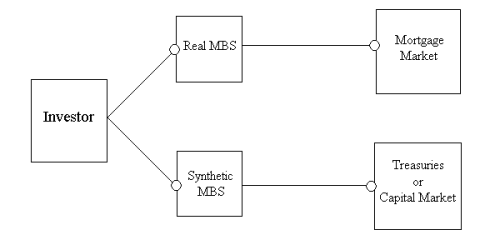 Note that synthetic MBSs can exist only when there is a protection buyer for the CDS that comprises part of the synthetic. Only when interest rates on MBSs drop low enough, along with the price of protection on MBSs, will protection buyers enter CDS contracts. So when protection buyers think that interest rates on MBSs are too low to reflect the actual probability of default, their desire to profit from this will spur the issuance of synthetic MBSs, thereby diverting cash from the mortgage market and into either Treasuries or other areas of the capital markets. Thus, the existence of CDSs operates as a safety valve on the issuance of MBSs. When interest rates sink too low, synthetics will be issued, diverting cash away from the mortgage market.